Jacques Cœur (/kɜːr/; French: [kœʁ]; c. 1395 in Bourges – 25 November 1456 in Chios), was a French merchant, one of the founders of the trade between France and the Levant. He was born at Bourges, the city where his father, Pierre Cœur, was a rich merchant. Jacques is first heard of around 1418, when he married Macée de Léodepart, daughter of Lambert de Léodepart, an influential citizen, provost of Bourges and a former valet of John, Duke of Berry. In 1436, Cœur was summoned to Paris by Charles VII, and made master of the mint. This post was of great importance, and the duties onerous. The country was deluged with base monies from three reigns, charged with superscriptions both French and English, and Charles was determined to make sweeping reforms. In this design he was ably seconded by the merchant, who, in fact, inspired or prepared all the ordinances concerning the coinage of France issued between 1435 and 1451. In 1438, he was made steward of the royal expenditure; in 1441 he and his family were ennobled by letters patent. He chose the motto A vaillans cuers riens impossible, "To a valiant heart, nothing is impossible". In 1444, he was sent as one of the royal commissioners to preside over the new parliament of Languedoc in Pézenas, where his house can still be seen, a position he held until the day of his disgrace. In 1445, his agents in the East negotiated a treaty between the sultan of Egypt and the knights of Rhodes; and in 1447, at his insistence, Jean de Village, his nephew by marriage, was charged with a mission to Egypt. The results were most important; concessions were obtained which greatly improved the position of the French consuls in the Levant, and that influence in the East was thereby founded which, though often interrupted, was for several centuries a major commercial glory for France. In the same year, Cœur assisted in an embassy to Amadeus VIII, former Duke of Savoy, who had been chosen Pope as Felix V by the council of Basel and in 1448 he represented the French king at the court of Pope Nicholas V where he was able to arrange an agreement between Nicholas and Amadeus, and so end the papal schism. Nicholas treated him with the utmost distinction, lodged him in the papal palace, and gave him special licence to traffic with the infidels. From about this time he made advances to Charles to carry on his wars and in 1449, after fighting at the King's side throughout the campaign, he entered Rouen in Charles' triumphal procession. At this point, the great trader's glory was at its height. He had represented France in three embassies, and had supplied the sinews of the war which had ousted the English from Normandy. He was invested with various offices of state, and possessed the most colossal fortune that had ever been amassed by a private Frenchman. The sea was covered with his ships; he had 300 managers in his employ, and business houses in all the chief cities of France. He had built houses and chapels, and had founded colleges in Paris, Montpellier and Bourges. The house in Bourges was exceptionally magnificent and remains today one of the finest monuments of the Middle Ages in France. He also built there the sacristy of the cathedral and a sepulchral chapel for his family. His brother Nicholas Cœur was made Bishop of Lyon, his sister married Jean Bochetel, the King's secretary, his daughter married the son of the Viscount of Bourges, and his son Jean Cœur became Archbishop of Bourges. But Cœur's huge monopoly caused his ruin. Dealing in everything: money and arms, furs and jewels, brocades and wool, a broker, a banker, a farmer, he had absorbed the trade of the country, and merchants complained they could make no profit because of him. He had lent money to needy courtiers, to members of the royal family, and to the King himself, and his debtors, jealous of his wealth, were eager for a chance to cause his downfall. Jacques Cœur is mentioned by Fulcanelli in Le Mystère des Cathédrales (1926) where the "master alchemist" speculates that Cœur was a successful alchemist or associated with alchemists and that he was a silversmith in the literal sense, i.e. that he could transmute base metals into small quantities of silver. In 1455 Jacques Cœur, wherever he was confined, contrived to escape into Provence. He was pursued, but a party headed by Jean de Village and two of his old managers, carried him off to Tarascon, whence, by way of Marseilles, Nice and Pisa, he managed to reach Rome. He was honorably and joyfully received by Nicholas V, who was fitting out an expedition against the Turks. On the death of Nicholas, Calixtus III continued his work, and made his guest, Cœur, captain of a fleet of sixteen galleys sent to the relief of Rhodes. Cœur set out on this expedition, but was taken ill at Chios, and died there on 25 November 1456. After his death Charles VII showed himself well disposed to the family, and allowed Jacques Cœur's sons to inherit whatever was left of their father's wealth. Et pourrir sous riche tombeau." and rot in your rich tomb." ^ "Coeur". Collins English Dictionary. This article incorporates text from a publication now in the public domain: Chisholm, Hugh, ed. (1911). "Cœur, Jacques" . Encyclopædia Britannica (11th ed.). Cambridge University Press. Bourges is a city in central France on the Yèvre river. It is the capital of the department of Cher, and also was the capital of the former province of Berry. Edgar Faure was a French politician, essayist, historian, and memoirist. Jacques Cujas was a French legal expert. He was prominent among the legal humanists or mos gallicus school, which sought to abandon the work of the medieval Commentators and concentrate on ascertaining the correct text and social context of the original works of Roman law. Jacques-Donatien Le Ray de Chaumont was a French "Father of the American Revolution", but later an opponent of the French Revolution. His son of the same name, known also in America as James Le Ray, eventually became a United States citizen and settled in Le Ray, New York USA. Jacques Auguste de Thou (Thuanus) was a French historian, book collector and president of the Parlement de Paris. 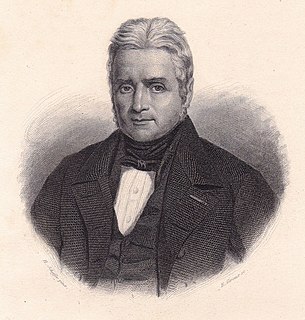 François Hotman was a French Protestant lawyer and writer, associated with the legal humanists and with the monarchomaques, who struggled against absolute monarchy. His first name is often written 'Francis' in English. His surname is Latinized by himself as Hotomanus, by others as Hotomannus and Hottomannus. He has been called "one of the first modern revolutionaries". Gabriel, comte de Montgomery, seigneur de Lorges, a French nobleman, was a captain of the Scots Guards of King Henry II of France. He is remembered for mortally injuring King Henry II in a jousting accident and subsequently converting to Protestantism, the faith that the Scots Guard sought to suppress. He became a leader of the Huguenots. Sancerre is a medieval hilltop town (ville), commune and canton in the Cher department of central France overlooking the Loire River. It is noted for its wine. 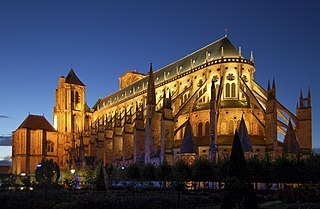 The Roman Catholic Archdiocese of Bourges is an archdiocese of the Latin Rite of the Roman Catholic Church in France. The Archdiocese comprises the departements of Cher and Indre in the Region of Val de Loire. Bourges Cathedral stands in the city of Bourges in the department of Cher. Rodulf was the archbishop of Bourges from 840 until his death. He is remembered as a skillful diplomat and a proponent of ecclesiastical reform. As a saint, his feast has been celebrated on 21 June. Menetou-Salon is a commune in the Cher department in the Centre-Val de Loire region of France. Inhabitants of the area are known as Monestrosaloniens. Germain Louis Chauvelin, marquis de Grosbois, was a French politician, serving as garde des sceaux and Secretary of State for Foreign Affairs under Louis XV. Charles-Marie-François Olier, marquis de Nointel (1635—1685), a councillor to the Parlement de Paris, was the French ambassador to the Ottoman court of Mehmed IV, from 1670 to 1679, charged from the first with renegotiating the Capitulations under which French merchants and others did business within the Ottoman Empire. Le Double Amour (Double Love) is a 1925 French melodrama film directed by Jean Epstein and produced by the Films Albatros production company.